Bonn – Sustainable development means finding a balance between the need for socio-economic development, the protection of the environment, and the preservation of our earth for present and future generations. These topics of global political relevance demand international research cooperation. The 2017 Green Talents competition will address these topics with a special focus on the theme of “Sustainable Production and Consumption”. 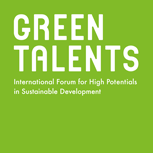 The “Green Talents – International Forum for High Potentials in Sustainable Development” was launched in 2009 by the German Federal Ministry of Education and Research and honours 25 young researchers each year. “Long-lasting contacts between up-and-coming talent and established experts have an important role to play here. This is why the Green Talents competition aims to build up an extensive, interdisciplinary network of experts from science and industry to work together on the key objectives of shaping the future, transforming global challenges into opportunities, and creating liveable and decent conditions for all” explains Minister and patron of the award Johanna Wanka. Since its inception, the award has recognized 182 young researchers and scientists from 51 nations for their outstanding achievements and contributions to making their communities, countries and societies more sustainable. The award-winners are selected by a jury of renowned German experts and are granted unique access to Germany's research elite.